On Wednesday, Texas pharmacy hosted an event for Texas Senate Health and Human Services committee Chair Dr. Charles Schwertner at the home of TPA CEO Debbie Garza and her husband, José. Senator Schwertner is the ONLY pharmacist in the Texas legislature, and pharmacy’s legislative bills must be heard in his committee. More than 50 pharmacists and pharmacy supporters came out to show their support for Chairman Schwertner. The event showed that Together Pharmacy Advances! The Senator delivered remarks to the group and said, "If you don't have a unified message at the Capitol, it's hard to get anything done." We showed him pharmacy in Texas is strong and supportive of him. Thank you to the many pharmacists, technicians, student pharmacists, and pharmacy organizations who contributed to make this event a success! This event helped demonstrate to the Senator that Texas pharmacy is working together and is a force to be reckoned with in the political arena. Pharmacy Strong: Texas pharmacy gathered to meet with State Senator Dr. Charles Schwertner. View more photos from the event on the TPA Facebook page. 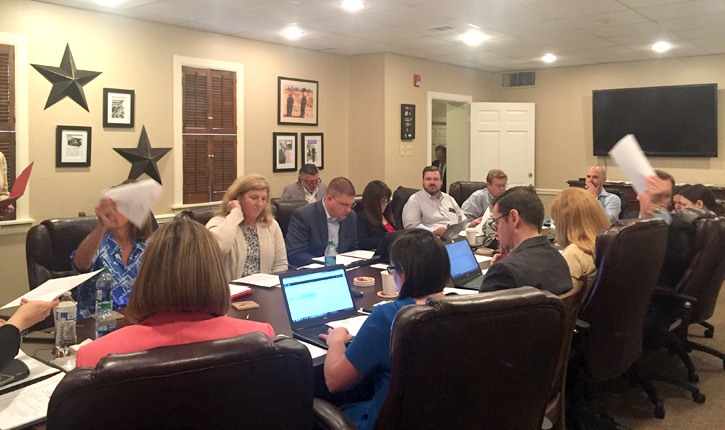 Last Friday, TPA joined other Texas pharmacy stakeholders, HHSC Executive Commissioner Charles Smith and senior agency staff to discuss Budget Rider 60 (previously Rider 219). The rider was the result of a pharmacy-led effort during the 2017 Legislative Session requiring the state to study potential Medicaid cost savings. The Rider requires HHSC to look at potential cost savings that may be achieved through a single fiscal agent (PBM) providing prescription drug benefits. The rider also requires HHSC to look at shifting Medicaid Managed Care pharmacy payments to the National Average Drug Acquisition Cost (NADAC), with a professional dispensing fee based off a recent dispensing fee cost study. During the meeting, pharmacy shared its belief that a single fiscal agent has the potential to bring much needed transparency, cost savings, and better certainty for the roughly $8 billion biennial Medicaid prescription drug benefit. Of note, consulting firm Deliotte was hired by HHSC to conduct the analysis and provide a report prior to the 2019 Texas Legislative Session. TPA thanks Brittani Bilse of the Alliance of Independent Pharmacists for setting up this meeting. 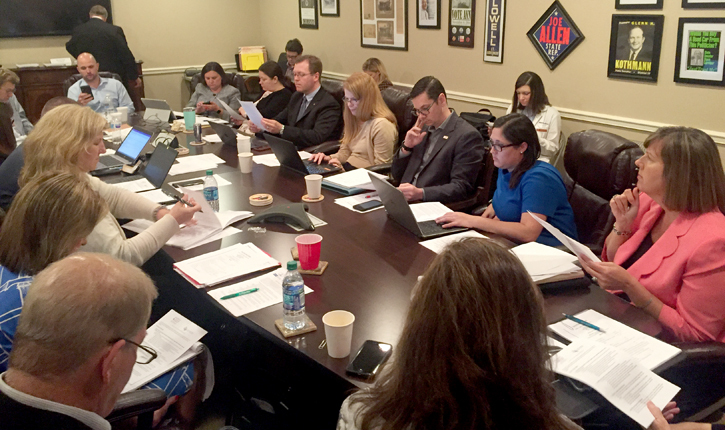 The Texas Pharmacy Summit, consisting of eight Texas pharmacy organizations, moved another step closer this week in its effort to establish a comprehensive legislative agenda for the 2019 Texas Legislative Session. Summit members discussed legislative strategy for key pharmacy issues including expanding access to care through additional patient-care services pharmacists can provide and payment for these services, expansion of immunization authority by pharmacists, Medicaid managed care and value-based purchasing, pharmacy benefits managers, distribution of repackaged or compounded drugs to hospital pharmacies, as well as the role pharmacists can play in the opioid epidemic impacting communities. Summit members discussed a variety of legislative strategy topics. TPA President Mary Klein and President-Elect Mark Comfort (second and third from right) contribute to the discussions. The Texas State Board of Pharmacy’s (TSBP) quarterly meeting was held on Tuesday, May 1. TSBP approved the final adoption of rules addressing prescription pick-up, automated check, storage and distribution devices, dispensing logs, telepharmacy, prescription drug order clarification and freestanding emergency medical care facilities. Additionally, TSBP approved moving forward the proposed rules addressing pharmacy license applications, change of location by sterile compounding pharmacies, inspection warning notices, fingertip and media fill testing under common ownership, CE requirements for pharmacists consumer notifications and technician training programs. However--in a 3-for, 3-against, and 1-abstaining vote--TSBP elected not to move forward with proposed rules concerning disciplinary action as related to aggravating and migrating factors. Discussions during the meeting included the need to clarify in rules a pharmacist’s ability to dispense a quantity less than prescribed to a patient. While this has been standard practice for years, recent events have lead TSBP to recognize a need to provide better direction. Rule language and discussion items can be found by clicking on the meeting agenda. Please provide any comments or concerns you may have regarding any of the proposed rules or discussions items to Public Affairs Division Director Justin Hudman (jhudman@texaspharmacy.org). The Texas State Board of Pharmacy discussed and adopted a number of rules at its May 1 meeting. Beginning May 18, prescribing pharmacists are able to enroll in Texas Medicaid as an ordering, referring, or prescribing provider. In accordance with federal regulation 42 CFR 455.410, prescribing pharmacists who write prescriptions for people enrolled in Medicaid fee-for-service must enroll as an ordering, referring, or prescribing provider. This requirement does not apply to manage care. To allow prescribing pharmacists time to enroll with TMHP, VDP will not deny pharmacy claims when the prescribing pharmacist is not enrolled until Aug. 20, 2018. Please refer to the TMHP website for more information and enrollment instructions. State social services czar Charles Smith, a longtime aide to Gov. Greg Abbott, is retiring from state government, he announced Thursday. Smith will step down as executive commissioner of the Health and Human Services Commission on May 31. Do You Know the ABC's of Viral Hepatitis? May is Hepatitis Awareness Month. Hepatitis, which means inflammation of the liver, can be caused by heavy alcohol use, toxins, some medications, and certain medical conditions. However, hepatitis is most often caused by a virus. In the United States, the most common types of viral hepatitis are Hepatitis A, Hepatitis B, and Hepatitis C.
Illnesses from Mosquito, Tick and Flea Bites Increasing in the U.S. Illnesses stemming from mosquito, tick and flea bites are on the rise in the U.S., according to the CDC. The agency tracked more than 640,000 reported cases between 2004 and 2016 and found nine new germs spread by mosquitoes and ticks were discovered during the time frame. Industry analysts expect President Donald Trump to focus on Medicare Part B drug coverage in an upcoming speech as high-priced specialty drugs gain market share. FDA for years classified pregnancy drugs as Category A, B, C, D, or X, depending on the risk they posed to a mother and her unborn child. Worried that the system could be misleading--suggesting, for example, a correlation between the degree of risk and the category letter--the agency in 2014 introduced a new approach. HHS has teamed up with Proniras Corporation of Seattle to develop a new treatment for seizures that cannot be stopped with current medicines. HHS noted that uncontrollable seizures can result from exposure to nerve agents, and they can be deadly or lead to permanent brain damage. Community-based organizations are now allowed to enroll as Medicare suppliers under the CMS' newly expanded Medicare diabetes prevention program model, enabling providers to offer evidence-based diabetes prevention services after earning certification for type 2 diabetes prevention from the CDC. The FDA and the Federal Trade Commission sent letters warning 13 e-cigarette liquid manufacturers and sellers to change the packaging of eight nicotine-containing e-cigarette liquids resembling child-friendly food products, such as cookies, candies, juice boxes and whipped cream, that endanger youths. In an effort to boost treatment for opioids addicts, one strategy lawmakers are trying is to force drug companies and their distributors to pay for it. Legislation introduced in at least 15 states would add taxes or fees to prescription analgesics, with several measures directing millions of dollars toward treatment and prevention initiatives. Video directly observed therapy (VDOT), an mHealth platform in which patients record themselves taking medications through an app, could improve adherence rates and slash costs, according to a new study published in Open Forum Infectious Diseases. Researchers at Johns Hopkins University monitored 28 tuberculosis patients managed by three Baltimore-area public health agencies between March 2016 and August 2017. The 2017-18 influenza season has been one of the worst flu seasons in years, resulting in pharmacists immunizing patients throughout the season. Standing out this season were those pharmacists who could offer point-of-care influenza testing, and then work with a prescriber to dispense antiviral medication on the spot as needed. More than 5,200 drugs for cancer are in some stage of development, but many drugs are similar to one another, posing difficulties for investors. 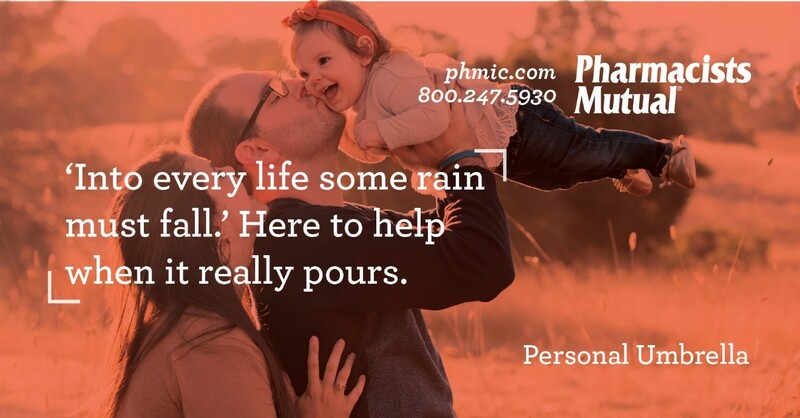 In accountable care organizations (ACOs), achieving changes in patient health behavior demands high-touch wellness coaching—a service that pharmacists are expertly positioned to deliver. Beth Israel Deaconess Care Organization (BIDCO) is one ACO that recognizes the contributions pharmacists can make toward engaging and motivating patients. The nonprofit organization USP has updated its Ingredient Verification Programs (IVP), which help companies ensure they meet quality standards for ingredients used in the manufacture of drug products and dietary supplements. "We created our Ingredient Verification Programs to provide finished product manufacturers with the assurance that the ingredients they use are held to the highest quality standards and are made using safe, sanitary, and well-controlled manufacturing practices, which is necessary for them to make quality health products for consumers," said John B. Atwater, senior director of USP Verification Services. The percentage of adults in the US who say drugmakers shoulder the most blame for the nation's opioid misuse crisis rose from 15% last year to 25% in April in a Survey Monkey/Axios poll.